Mortgages are complex financial products that need to be carefully considered by prospective customers such as first-time home buyers. Consequently, the organizations and companies offering mortgages need to provide a good deal of information and advice on them. This dissertation explores the design of the communication means and activities, in particular consultations, that are offered by a large bank to guide customers through their mortgage decision-making process. 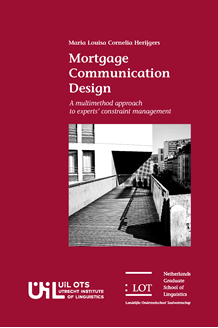 In four studies it is analyzed how the design of mortgage communication is affected by various constraints concerning context, technology and interaction and how these sometimes conflicting constraints are met by professionals. Issues that will be discussed in this dissertation involve, for instance, the contents and timing of mortgage information and the channels chosen to convey it, as well as experts’ interactional design of information concerning mortgage concepts, mortgage processes or institutional policies and also, the way in which advisors combine computer use and customer-centeredness when the computer is required for the consultation’s continuation. Finally, this dissertation proffers some suggestions for the improvement of communication in other settings in which lay persons are faced with complex decision-making, such as in medical, financial and political settings.